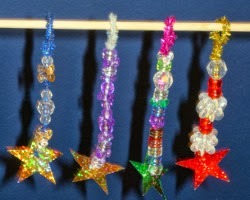 These easy beaded icicle ornaments are a fun and easy craft for the kids to do this Christmas. Use colorful sequins and metallic beads to make these easy Christmas ornaments. Thread one large sequin on to the pipe cleaner. Fold up about 1/4” of the pipe cleaner to make a knot (so the sequin does not slide off). Thread on beads in desired pattern until you reach your desired length. Be sure to leave about 3” of pipe cleaner at the top to make a loop. Bend pipe cleaner over to just reach the last bead. Twist the end to hold in place. Now you should have a loop to hang your icicle on the tree.